Please bring a book instead of a card. Brilliant. Just brilliant. Instead of spending five dollars on a simple greeting card, we upped the ante a bit and included a children’s book with our gift. I couldn’t help but to pick up a copy of one of my personal favorites: The Little Mouse, the Red Ripe Strawberry and the Big Hungry Bear. As an inquisitive little girl, my parents were patient to read to me on a regular basis. By the time I was about five years old, I was “reading” What Is a Rainbow?, reciting each line by memory based on the illustrations on each page. My affinity for reading increased through elementary school and must have peaked when my hobby was forced to be a requirement in Junior High. Today, I truly enjoy relaxing with a good book, but I would not consider myself an avid reader. Put a book in my hand to read before bed and I am guaranteed to be drifting off to Dreamland in no time flat. I had full intentions of diving into my current read on our five hour train ride to Glenwood Springs (more to come on that adventure in a future post! ), but found myself captivated by the landscape of the Rocky Mountains. The distraction moved my goal from being leisurely accomplished on our Independence Day vacay to my list of to-do’s for this week. I’m determined to get through it. So goes my relationship with reading. 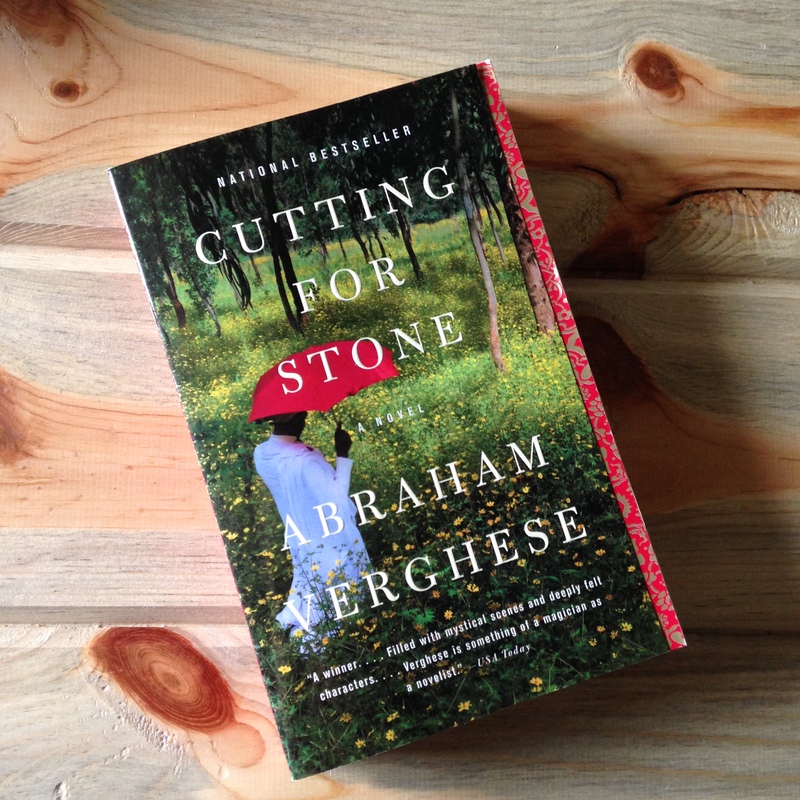 During one of his rotations this year, the Hubs was introduced to a novel that was also new to me: Cutting for Stone by Abraham Vergehese. The synopsis on the back cover was intriguing, but the mere size of the 658 page brick sitting on our coffee table was clearly not going to fit into a summer schedule already packed with tri training and social/ family events. It just wasn’t. I may have cracked the cover, but I knew the inevitable would set in and it would be abandoned, left in my grey felt box for another day. . . or another year. Both Mike and I commute a minimum of 70 minutes each day. When I discovered a few quality podcasts, it was a life-saving moment. My almost six hours in the car each week was now a time for learning, inspiration and GROWTH! Mike followed suit by adding a shiny new Audible.com membership to our Amazon Prime account. Between Audible and the OverDrive app, I expanded my drive time options to include some of the book titles on my list. Once Mike finished listening to Cutting for Stone, he knew I would want to get through it for myself. Through the month of May, I was transported to another place and time during my daily commute. I even found myself enjoying the sound of Sunil Malhotra’s voice as I pounded pavement in preparation for my next race. His ability to bring life to the characters through subtle changes in inflection and various accents was truly entertaining. Cutting for Stone is a fictional novel, laced with both historical significance and medical terminology. The opening words set the stage in 1954 when twin boys make their way into this world – twin boys, born to an Indian Catholic nun who is working as a nurse in an Ethiopian hospital. Through a number of dramatic twists and turns, the characters find themselves in challenging situations as a result of their own actions and the actions of others. With the bit of anatomy and medical training I have, combined with Mike’s pursuit of his M.D., I found the details of the diagnoses and the high-stakes operations to be fascinating. Vergehese doesn’t miss a beat in his ability to describe each situation with vivid detail. His story incorporates a number of cultures, generations and personalities — all coming together to tell a tale of loss, triumph, betrayal, passion, change, perseverance, and love. As a disclaimer, this book does contain some graphic content including strong language, some violence and risqué scenarios. I would strongly caution against sharing this book with young readers. On a personal note. . . Daughter of the King who is learning daily what it means to surrender weak and feeble plans, in exchange for His strength. Captivated by Grace. Head-over-heels in love. Amazed at the valiant work of the relentlessly courageous ones.